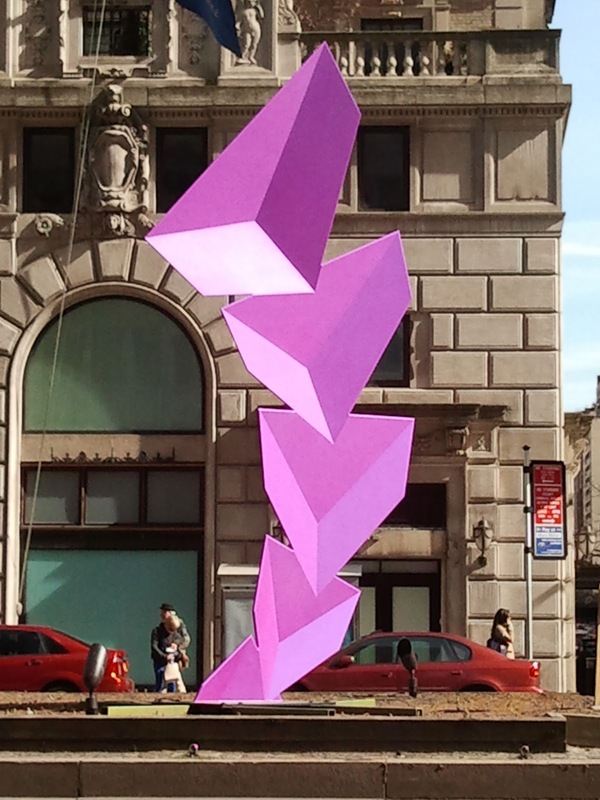 Another free public art display in the city! If the West Side has Peter Woytuk on Broadway which I wrote about here and here, a new display can be found on the East Side along Park Avenue. Nine sculptures made of stainless steel and lacquer by Venezuelan-American artist Rafael Barrios are on display from March until June 2012. The exhibit is a collaboration by the New York City Dept. of Parks & Recreation, The Fund for Park Avenue Sculpture Committee, and the Art Nouveau Gallery of Miami. The first sculpture starts on 50th Street near the Waldorf-Astoria Hotel and goes on for 18 blocks up to the Park Armory on 68th Street. So last weekend, I spent the day walking along Park Avenue to see the sculptures. They look like they're floating, a kind of an optical illusion, and a pretty one at that. This article from the Parks and Recreation website can describe it better .. Experimenting with form and volume, Barrios intends to trick the eye, creating a territory where the laws of gravity do not exist and objects appear balanced in space. As people stroll down the avenue or speed by in their cars, the geometric sculptures will be in continuous flux—weighty, broad cubes will morph, exposing their true slenderness and Barrios’ expertise in illusion. 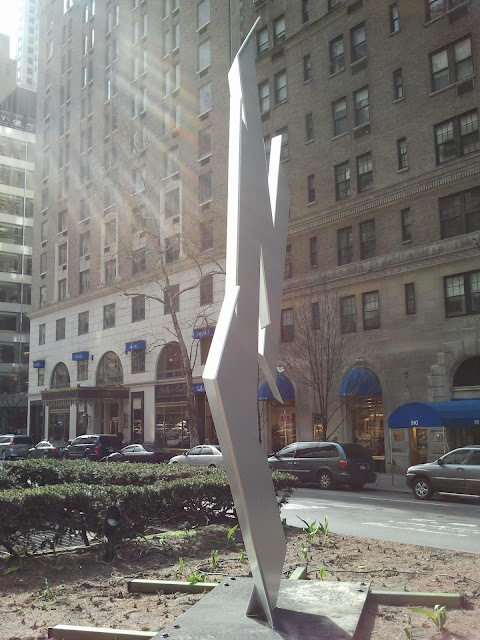 Here's the first sculpture called Centrifuga, it is right by the Waldorf Astoria Hotel. I wasn't able to get the name of the next sculpture as it was at the median between East 52nd and East 53rd Streets. However, I took pictures of both the east side with the Seagram Building as background. and the Racquet and Tennis Club Building on the west side. The next sculpture along 55th Street is called Obtusa. And then a splash of fuchsia for Triphasique. Then it's on to the next sculpture called Oblicua. As you walk around the sculpture, the broad shapes morph into thin stretches of steel, which is really what they look like. Talk about appearances and the power of illusion! It was several blocks later that I saw the next sculpture, I don't know why these were not evenly spaced between the covered blocks but I'm not complaining. It was a great day for a walk and to enjoy the sights. I wasn't able to get the name of the above sculpture as I was busy admiring the Central Presbyterian Church by the corner. Just look at its bell tower. The seventh and eighth sculptures bookend the Park Avenue Armory Building where Barrios’ smaller-scale work is currently showcased. One of the sculptures is called Malabarismo Lineal. Here's the sculpture with the Park Avenue Armory Building at the background. At the other end of the building is Trifascica. 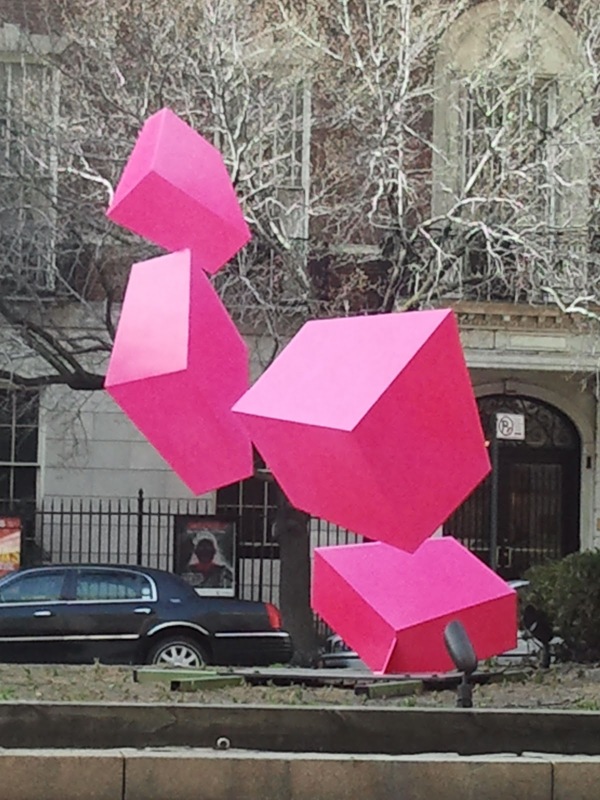 The last sculpture, Flight, 2011 is a burst of dark pink color. This is what it looks like from across the street. You can't help but marvel how the sculptures look different when viewed from another angle. Even the reflection of the sun sometimes makes the colors lighter or darker depending on where you're standing as you view them. 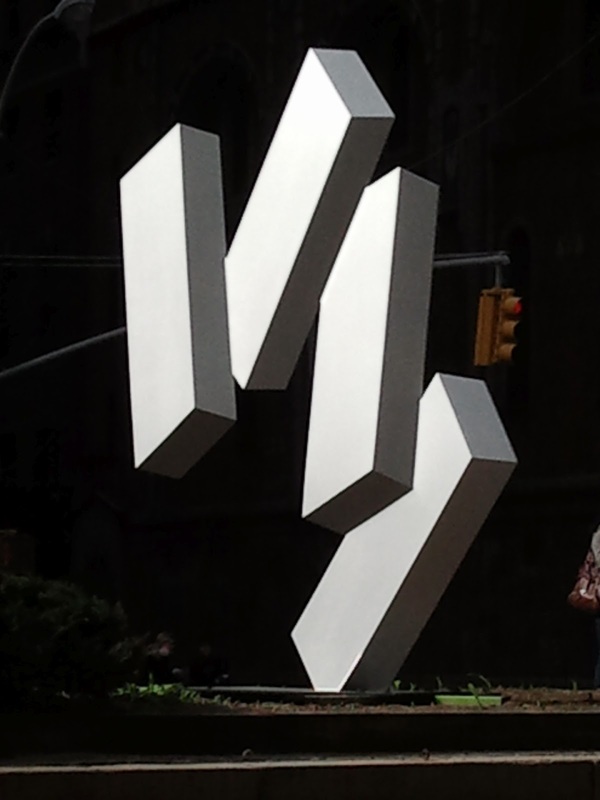 In between the second and third sculpture, I made a detour along 53rd Street to Paley Park. I wanted to revisit these five sections of the Berlin Wall which were originally located along the Waldemarstrasse. These were decorated by German artists Thierry Noir and Kiddy Citny in 1985, as indicated in a small plaque next to it.. 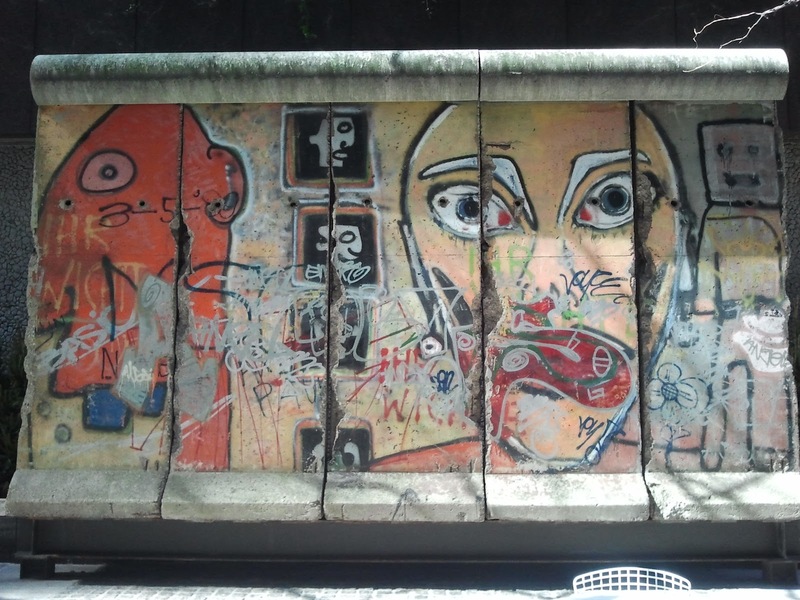 The Wall was located near the side wall of Paley Park. When you round that side wall it leads you to the park proper. Paley Park, which is on the Project for Public Spaces list as one of the best parks in the world, is a small vest-pocket park yet it is an awesome escape from the hustle and bustle of city life. I'm so glad I took the time to drop by. 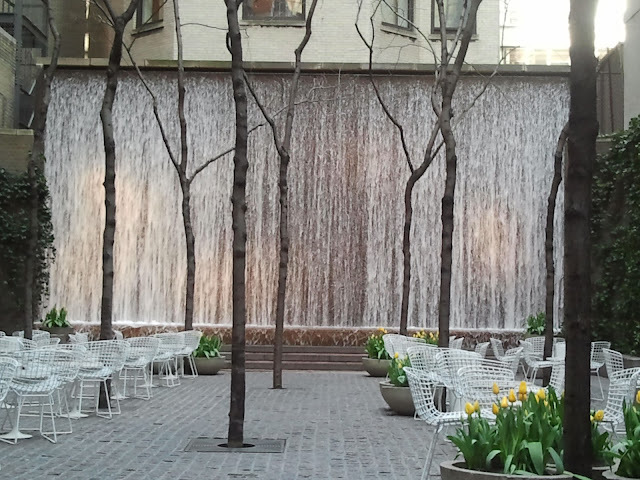 The waterfall and the yellow tulips are a very welcome sight, just like Rafael Barrios' sculptures displayed on Park Avenue.